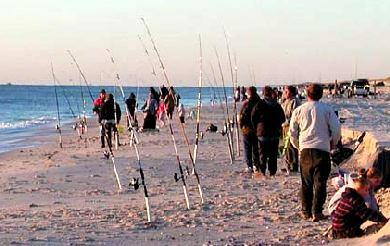 The annual Governor's Surf Fishing Tournament is held on the third Sunday in May at Island Beach State Park. In 2019 the tournament will be held on Sunday, May 19. A variety of species are eligible for entry in the tournament each year. Overall length determines the winner. All fish must meet minimum length tournament requirements. Tournament fishing hours are 6:30 a.m. to 1:00 p.m. The individual who catches the overall largest fish wins the "Governor's Award," and has his/her name engraved on the Governor's Cup, which is permanently displayed at the park. Fishing equipment is awarded to winners who catch the largest fish in each species category. Winners from the early entry drawing and the tournament must be present during the afternoon awards ceremony to claim their prizes or they will be forfeited. The High School Team Category is for high school aged students, who are part of a formal fishing club, members of a Hooked on Fishing-Not on Drugs group, or a non-formal group. The tournament entry fee is waived for student teams, and admission to the park is free for registrants.